What a discovery! Last night, I tried Simple Suppers To Go for the first time. Here's how it works, you go to their site, decide what you want to make from their menu, pick a date and time. Then you show up and they have all the prep work done for you. Each station is an entree and you move around the room making your food. 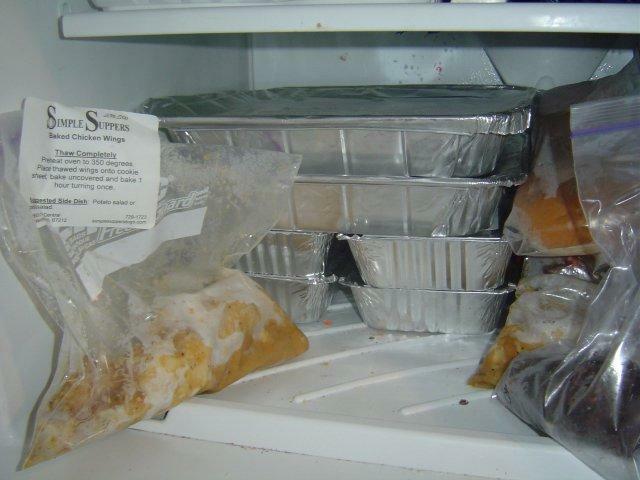 They provide the bags and foil containers then you take it home and freeze it. And they even come and clean up after you. I loved it. I got the 12 entrees that feed 3 people each and it was only $100 (what a bargain). I made calzones, pulled pork sandwiches, chicken pot pie, bacon wrapped sirloin, meatloaf, baked chicken wings, oriental pork chops, everything looks wonderful and I can't wait to taste them all. I have already signed up to go again in 2 weeks. Yummy... I am jealous and shall talk to the hubby about budgeting in this. Wow! Twelve dinners for $100 is a bargain!